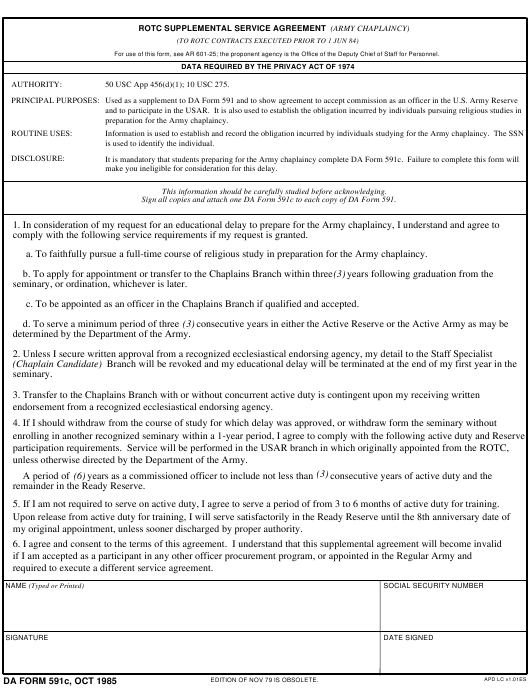 DA Form 591C - also known as the "Rotc Supplemental Service Agreement (army Chaplaincy)" - is a Military form issued and used by the United States Department of the Army. The form - often mistakenly referred to as the DD form 591C - was last revised on October 1, 1985. Download an up-to-date fillable PDF version of the DA 591C below or request a copy through the chain of command. Sign all copies and attach one DA Form 591c to each copy of DA Form 591.
comply with the following service requirements if my request is granted. endorsement from a recognized ecclesiastical endorsing agency. remainder in the Ready Reserve. 5. If I am not required to serve on active duty, I agree to serve a period of from 3 to 6 months of active duty for training. required to execute a different service agreement. EDITION OF NOV 79 IS OBSOLETE.